I stumbled upon these cupcakes and I just had to share them. They say the way to a persons heart is through their stomach, but in this case a heart can actually wind up *IN* your stomach! I originally saw them on Not So Humble Pie, and she shared the link to the original baker Lily Vanilli. If you want to attempt to make your own you can find the complete instructions here. 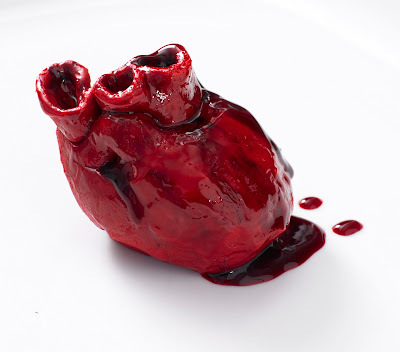 Scarily realistic, each edible heart cake is baked with a delicious red velvet sponge, cream cheese frosting and blackcurrant & cherry 'blood'.A single ʻbleeding heart cakeʼ is priced at £7 and comes in a cute perspex box tied with apink or red ribbon with a personal note. It would be a great valentine treat for your favorite Anatomist or Physiologist. Happy Valentine's Day! Eat your heart out. Wow. That "blood" actually looks pretty real! Creepy and delicious. I like it! 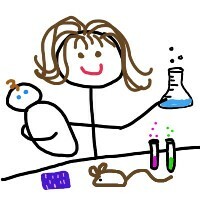 I kind of want to make one now, but not for V-Day. I want to make them for an all offal dinner party. Mmmm I want one and what a fabulous idea!